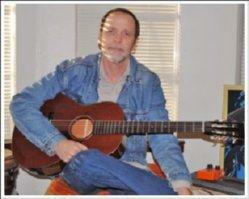 39+ 'One-on-One Guitar' Lessons with Jim Bruce - More than 700 Minutes of Instruction!
" I don't think you should have to pay a lot of money to get the best acoustic blues guitar lessons - these video lessons encapsulate everything learned over the past 40 years by a working blues man, and contain everything you need learn to play old style blues guitar - Guaranteed." Each lesson is presented as video file downloads, streamed online and also with option for delivery in Windows or Mac format on a data disk. PDF tablature file is included for printing out. Slow motion split-screen video of both hands ensure a rich learning experience. 12 hours of tuition - download, streaming and disk. Instant download immediately after payment. 100% Money Back Guarantee - No Risk! Jim has some great lessons here, they are step by step so you can take your time to get things right. He breaks down every part of the songs into bit-sized chunks that are easier to learn. Plus, he know what he is teaching, which a lot of guitar teachers don't quite know what the old blues masters were doing to actually teach the blues well. Jim does and demystifies what these greats were doing in an easy to follow format. With anything you will have to put in practice time, but Jim makes it easier by teaching a little bit of the song at a time. Great instructor with easy to follow videos and tabs.